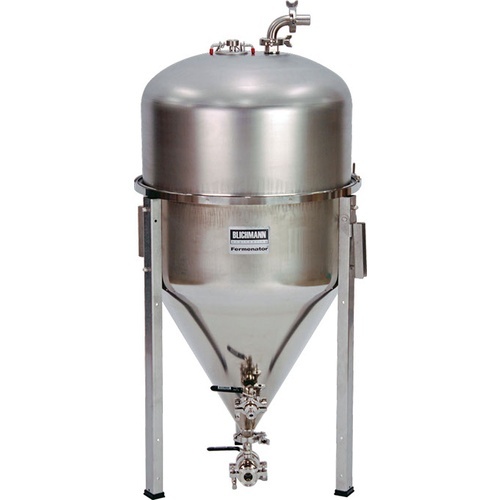 This stainless steel conical fermentor features a weld-free interior, a dump valve for removing yeast and sediment, and a rotating racking arm for transferring. Prior to bottling or kegging, you can dump your yeast and trub out of the bottom, making for a very clean transfer. This helps with a cleaner, crisper beer everytime! The lid has a removable soda keg-style hatch that is pressure capable, allowing you to easily transfer using CO2 to minimize air exposure. Optional casters and leg extensions are available as well. The 42 Gallon Fermenator is designed to ferment 1BBL at a time. Note - Conical will come with an airlock. Blow-off elbow not included. What's the shipping weight ? BEST ANSWER: Hi Alain - the weight of this product is 90lbs. What chiller coil do you recommend to use with the Blichmann 42 gal fermenator? BEST ANSWER: Hello Kevin - Blichmann claims it BL147 can be used with their 42 Gallon fermenter. I got the Fermenator a few years ago when it was pretty much the only reasonable option in the 1 BBL market. It seems like in order to cut cost Blichmann is using the same base that is used for the smaller fermenters. It would have been much better to create a "deeper" bottom unit with a smaller domed lid. The rubber ring that seals the top and bottom piece will eventually wear out and cause leaks. Not fun when there are at least 5 gallons of liquid in the doomed lid.